Due to seismic damage from the 1989 Loma Prieta Earth Quake, the Eastern span of the San Francisco - Oakland Bay Bridge is being demolished and replaced with a new span. 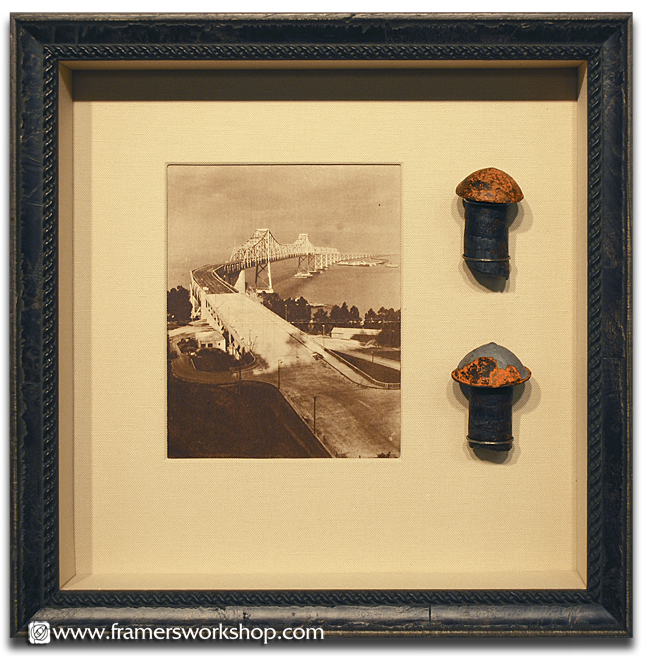 This customer has commemorated the old span by framing vintage newspaper photographs including actual bridge rivets. We used a dark Olive wood Larson-Juhl "Verona" shadowbox frame with gold lip accent, and hand wrapped a linen fabric over the mat and mat walls to showcase the images as well as the rivets which were wired in place. Each of these shadowboxes was protected with Tru Vue Museum Glass.